34th match of ICC Worldcup 2015 has been played between India and Ireland at Sudden Park, Hamilton today. India continued with good performances won the 5th consecutive match of ICC Worldcup 2015 by huge margins of 8 wickets with 79 balls remaining. S Dhawan declared man of the match for his 100 knock just in 85 balls. Earlier, Ireland won the toss and decided to bat first. Ireland got very good start with skipper WTS Porterfield and PR Stirling initially. Bot played well and contributed 57 and 42 runs respectively. Middle order batsman NJ O'Brien also played superb inning of 75 runs of 75 balls in middle overs. Ireland could not kept momentum on and lost middle and lower orders in regular interwals and managed to put 259 runs in 49 overs. 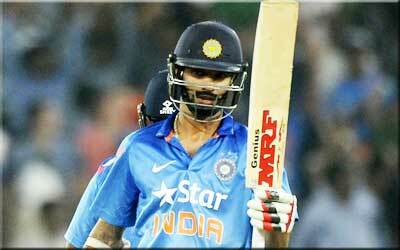 Following target of 260 runs, India made confiden start with RG Sharmaand S Dhawan. Both added 174 runs for 1st wicket before RG Sharma got out scoring very well 64 runs. S Dhawan made his 2nd century of this worldcup and made 100 runs before got out. Rest was done by V Kohli 44* and AM Rahane 33* runs and finished match in 36.5 overs and won by huge margins of 8 wickets.